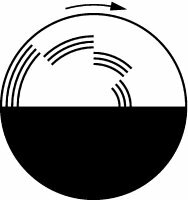 A disc, half black and half white with a number of concentric black bars on the white half which when rotated evokes a sensation of colour, called Fechner's colours or Fechner-Benham colours (Fig. B2). Syn. Benham-Fechner top.